On March 30, UI-7 News, the University of Illinois, Urbana-Champaign's student-run television and radio news broadcasting organization, produced a report about the Eleventh Annual EU Day. 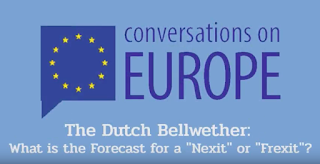 The report by Taylor Marti features European Union Studies students Lauren Turk and Whitney Taylor as well as footage from the Professionalism in Europe workshop, which kicked off the EU Day events. Check out the report below or by visiting the UI-7 News Vimeo page. EU Day at Illinois from UI-7 News on Vimeo. On March 27, as part of the Eleventh Annual EU Day events, Ambassador and Head of the Delegation of the European Union to the United States João Vale de Almeida took part in an interview with Focus, a radio interview program on Champaign-Urbana's NPR station, WILL-AM 580. 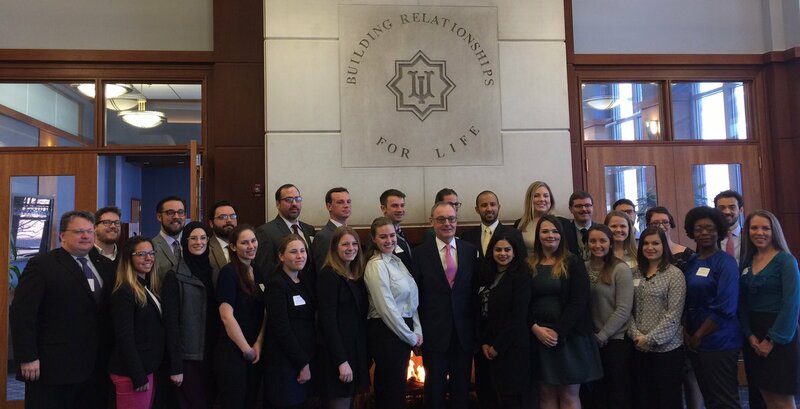 The Ambassador discussed topics ranging from the EU economic crisis to EU-US relations. His interview was followed by a conversation with Kostas Kourtikakis, Lecturer & Research Assistant Professor in the Department of Political Science at the University of Illinois and EUC-affiliated faculty member. You may also want to check out Dr. Kourtikakis' earlier Focus interview, which took place in August 2011. To listen to the interview, click here or visit its Focus page. On March 12, Dr. Angela Glaros delivered a lecture entitled "Gendered Musical Cultures in the Mediterranean" as part of the EUC's Jean Monnet Module course, Europe and the Mediterranean: Transnational Spaces and Integration. You can watch her full lecture below or by clicking here. Angela Glaros is an Assistant Professor of Anthropology at Eastern Illinois University. 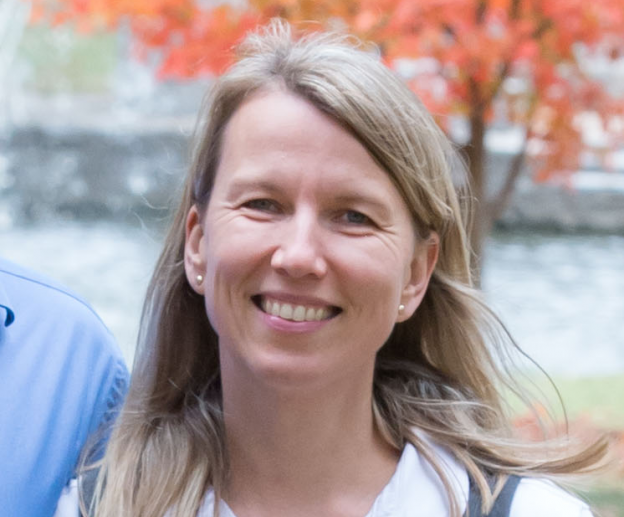 Her research interests include sociocultural anthropology, ethnomusicology, linguistic anthropology, and gender. On March 7, Dr. Antony Augoustakis delivered a lecture entitled "Women in the Ancient World: Greece and Rome" as part of the EUC's Jean Monnet Module course, Europe and the Mediterranean: Transnational Spaces and Integration. You can watch his full lecture below or by clicking here. Antony Augoustakis is an Associate Professor of Classics at the University of Illinois, Urbana-Champaign. His research interests focus on the cultural poetics and the sociopolitics of Flavian poetry. The EU Center is cosponsoring the Peoria Area World Affairs Council's 42nd Annual Central Illinois World Affairs Conference, taking place March 30-31. The following article, via peoriamagazines.com, provides a peek at the issues that the conference will cover. The EU-U.S. partnership is enduring, but the debt crisis is obligating some member states to implement new measures. What may be true for Las Vegas is certainly not true for Europe: what happens in Europe does not stay in Europe. 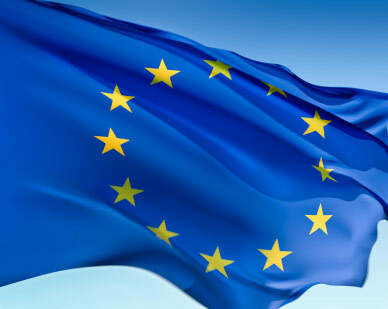 The ties between the United States and the European Union have been forged by deep cultural and economic connections based on a common set of values and historical cooperation in global affairs. Even as the number of its members has grown over the past 60 years, the EU and the U.S. continue to embrace the same core values, making transatlantic ties resilient and able to face the challenges of an ever-changing world. These values include a commitment to the democratic process, respect for human rights, a commitment to alleviate poverty, adherence to rule of law and the preservation of fair market economies. The European Union and the United States are each others’ largest trading partners. More importantly, the EU is also a significant economic partner for the State of Illinois. Of the 50 states, Illinois is ranked fourth in exports to the European Union, sixth in jobs supported directly by EU investments and seventh in direct investments in the EU, according to the European Union Center at the University of Illinois at Urbana-Champaign. The International Trade Administration notes that nearly 20 percent of Illinois exports go to the 27 nations of the European Union. The EU is currently working through some of the toughest challenges since its founding. It faces difficult austerity measures to address member states’ budgets and the viability of the euro zone. Recently, 25 of the 27 EU member states adopted a plan to deal with the underlying causes of the region’s debt crisis. The new fiscal pact obligates member states to implement strict new measures on sovereign budgets in order to prevent a recurrence of the overspending behind the current crisis. In addition, EU leaders have reached an agreement to introduce a permanent bailout mechanism that will replace the temporary mechanism used to bail out Ireland and Portugal. With a lending capacity of 500 billion Euros, the European Stability Mechanism will be a permanent fund with paid-in capital, building a stronger firewall against the debt crisis. 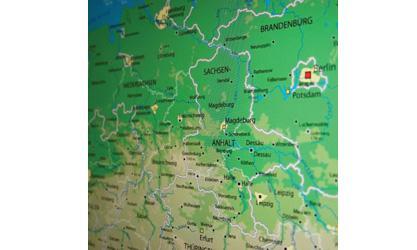 Germany leads in these efforts to stabilize the region’s economies. It can boast of declining unemployment rates, its economy has grown faster than the U.S. economy since the mid-1990s, and German children have stronger math and science skills than their American counterparts. Its export-driven economy has weathered the global recession quite well, and its European neighbors are calling on Germany to lend them a helping hand. But Germany is willing to help only up to a point. Chancellor Angela Merkel must still answer to her own citizens about how far the country is willing to risk its economic position to help the “Club Med” economies in its neighborhood. This contrast between German success and the failures of some of her neighbors is part myth, part reality. Like many of her neighbors, Germany had long-established unemployment benefits that discouraged work. About a decade ago, Germany cut many of those benefits in both duration and level, reduced incentives to retire early and began programs to return the long-term unemployed to the workforce. Facing an aging population with a declining birth rate, Germany has nudged some of its reluctant workforce back to work. At about the same time, Germany began to address its education system. These efforts have paid off, and German students now boast a national average in math scores higher than that in Massachusetts, the top state in the U.S. It is important to understand that the German model is not all about austerity and hard work—it is a mindset. The Germans have demonstrated not only a willingness to cut and make their government more efficient, but they are equally willing to use government and regulations to an extent that many would find intolerable in a market economy. This is where the German model may have limitations for countries like the U.S. The role of government in Germany involves significant regulation. For example, Germans maintain that the housing crisis had little effect there because of banking regulations on lending practices. They also feel that the laws and regulations which protect labor unions help the German middle class fare better than their global neighbors and preserve a purchasing power that bolsters their economy. Germans don’t pay low taxes; it is the original welfare state, after all. Rather, Germans are willing to raise taxes with the expectation that they will, in return, receive the benefits they desire. Current deficit-reducing measures, both in Germany and in the plan adopted by the EU, will require sharp cuts in spending, and similarly drastic rises in taxes. Whether the German model is something the U.S. can learn from or not will be the subject of many a debate. The U.S. has its own unique strengths, including an innovative and entrepreneurial society that maintains its status as the world’s immigration destination and the home of countless international corporations. These characteristics have kept the U.S. economy the strongest in the world. The transatlantic partnership represents the most enduring relationship in the world. According to the Delegation of the European Union, the European Union and the United States combined account for nearly 40 percent of world trade and 80 percent of governmental development assistance worldwide. This partnership is clearly the cornerstone of security and economic prosperity for both the U.S. and the EU. Our futures are linked. The EU Center is cosponsoring the Peoria Area World Affairs Council's 42nd Annual Central Illinois World Affairs Conference, taking place March 30-31. The following article, via pjstar.com, provides a peek at the issues that the conference will cover. 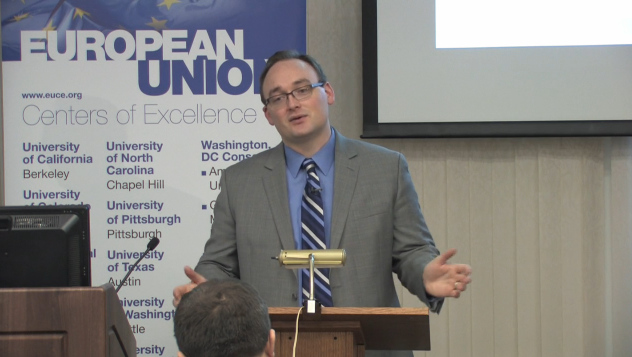 PEORIA — The economic crisis facing the European Union was anticipated five years ago by one of the speakers at the upcoming Central Illinois World Affairs Conference. “I predicted it in my book, ‘Design for a New Europe,’” said John Gillingham, a history professor at the University of Missouri at St. Louis, who will be among the speakers at the conference on the European Union and Germany presented by the Peoria Area World Affairs Council March 30 and 31 at the Par-A-Dice Hotel in East Peoria. “The European Union started out with a great deal of optimism,” said Gillingham of Europe’s unification efforts that started back in the 1950s. “Economic convergence has not taken place because European economies have become more dissimilar over the years,” he said. All bonds are considered equal, bearing the same amount of risk, under the EU charter, said Gillingham, who holds out little hope for an economic recovery under the union’s present regulations. “The problems are far greater than Greece. After Greece, it’s likely to be a rolling crisis from one thing to another. The problem is there’s just too much debt. It’s unsustainable,” he said. John McCormick, a professor of political science at Indiana University — Purdue University at Indianapolis, will argue that the union is sustainable. “There are three benefits to the European Union. The first is peace in Europe. Since the union, there’s been the longest spell of peace in Europe in 2,000 years. It’s been so successful that people forgot (past strife),” he said. “The second is that the EU has allowed 27 countries to be a global actor, forming the biggest markeplace in the world while the third is that it’s an institutional model now viewed as a new way of doing business. If it’s such a bad idea, why is everyone copying it?” asked McCormick. Gillingham has suggested that European countries rework the union concept. “There is a way to reform the union but they don’t find a three-tier system acceptable,” he said. What Gillingham suggests is a system that would have the more successful countries use the euro while other nations would use a combination of the euro and their own currency. Countries with debt problems would strictly use their own currency until achieving solvency, he suggested. Other speakers at the conference include João Vale de Almeida, ambassador and head of the European Union delegation to the United States; Onno Huckmann, consul general of Germany; and Jennone Walker, former U.S. ambassador to the Czech Republic. For more information, call 677-2454 or consult pawac@bradley.edu. The First Champaign Greek film festival, which took place March 2 and 3, was a great success. In total, 226 people attended the festival over a day and a half (7 films in total), which is among the best attendance rates for a foreign film festival in our town. Attendance was almost equally split between students and non-students, with non-students being both UI faculty and members of the community at large, many of whom had never seen a Greek film before. The festival was organized by the program in Modern Greek Studies in collaboration with the Chicago-based group FilmHellenes. FilmHellenes President and film director Niko Franghias attended the festival and gave a brief introduction about Greek film-making on both days. All films were introduced by Dr Vassiliki Tsitsopoulou, Visiting Lecturer in Modern Greek Studies, who is teaching a course on contemporary Greek culture and film this semester. Feedback about the festival has been overwhelmingly positive, with the audience clapping at the end of the last film, Attenberg. (You can read a review of the film in the New York Times). Many asked about next year's festival, treating this as the first of what should become an annual event. The festival also received good press coverage. It was featured in the Inside Illinois and the Chicago-based Greek Star newspaper issues of February 16, in the mt217.com of last week, as well as on WILL AM 580, WEFT and WPTO radio. Channel 15 news and UI-7 also provided TV coverage of the festival. 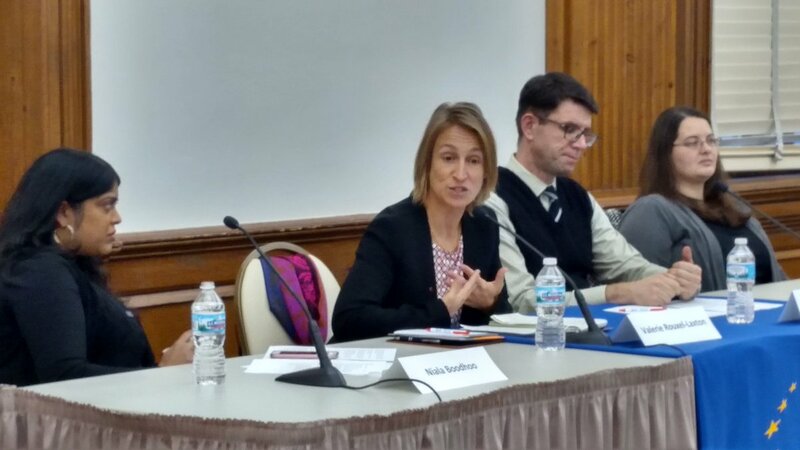 On February 17, Myra Marx Ferree, Director of the European Union Center of Excellence at University of Wisconsin - Madison, delivered a lecture entitled "Framing Inequalities in the United States, Germany, and the European Union: Race, Class, and Gender as Dynamic Intersections" as part of the EUC's Spring Lecture Series. You can watch her full lecture below. Myra Marx Ferree is the Alice H. Cook Professor of Sociology at the University of Wisconsin. Her new book is “Varieties of Feminism: German Gender Politics in Global Perspective”. The March 2012 edition of EU Focus, coincides with the European Union Center's initiative on "Europe and the Mediterranean: Transnational Spaces and Integration," partially funded by the European Commission's Jean Monnet Module grant. Read the message from Ambassador João Vale de Almeida, Head of the EU Delegation to the US, and check out this issue of EU Focus. The European Union has always placed a high priority on establishing and maintaining a close and special relationship with our neighbors in the Mediterranean and the Middle East. We are joined together through both history and geography; the Mediterranean has always been the cultural, economic, and political crossroads of Europe, Asia, and Africa. Catherine Ashton, the EU High Representative for Foreign Affairs and Security Policy, has often said that the European Union should be judged by our effectiveness in our own neighborhood. If we can support the countries on our borders as they become more sustainable, secure, and democratic, that is to the advantage of us all. In the current issue of EU Focus, you can learn more about the EU’s involvement in the Mediterranean region, ranging from our support for the Arab Spring countries to our commitment to the Middle East Peace Process.